On May 5, 1961 Alan Shepard became the first American to make a space flight on the spacecraft Freedom 7. The U.S.A. had suffered the humiliation of Yuri Gagarin’s orbital flight so they couldn’t stand by and watch. The Mercury program had been started in 1959 but it hadn’t achieved a manned space flight yet. 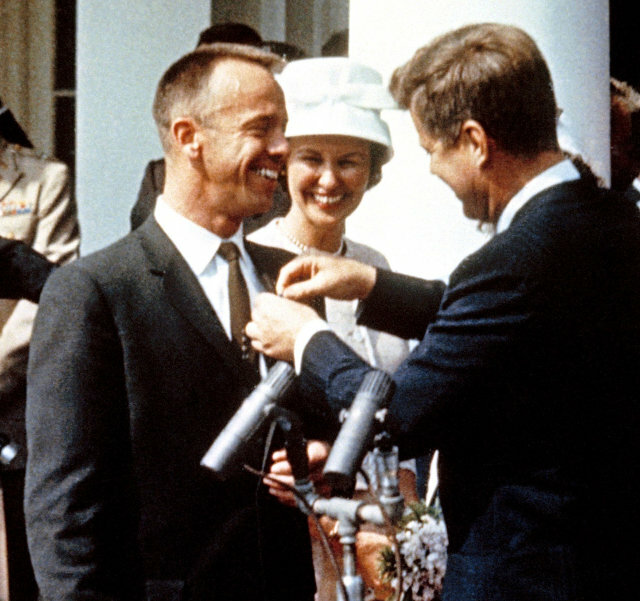 Alan Shepard was a U.S.A. Navy pilot and was one of 110 candidates taken into consideration by NASA, which had just been created, for the Mercury program. In early 1961 Shepard was chosen for the first U.S.A. space flight, which was initially scheduled for October 1960 but due to preparation problems had to be postponed. Finally on May 5, 1961 the spacecraft Freedom 7 could lift off. It was a suborbital flight which reached a height of less than 120 miles for a trip of about 300 miles but Alan Shepard became the first man to land in his spacecraft as Yuri Gagarin ejected from his one and landed with a parachute. The name of Alan Shepard doesn’t have the same weight as that of John Glenn, who on February 7, 1962 was the first American to make an orbital flight flying three times around the world on the Friendship 7 spacecraft, nor that of Neil Armstrong, the first man to set foot on the Moon. Alan Shepard had accomplished something big but unfortunately for him the Soviets had already done better and during the Cold War you had to be ahead of the Soviets to become a hero. In 1971 however Shepard was part of the Apollo 14 mission so he could set foot on the Moon, where color pictures of him playing golf were broadcasted. Today the anniversary of the first space flight by Alan Shepard is celebrated in the U.S.A. with a stamp showing him and his spacecraft. Along with that mission of the Mercury program the Messenger spacecraft sent to study precisely the planet Mercury was also celebrated with a stamp. It seems a bitter irony that in the U.S.A. the first space flight by an American is celebrated at a time when NASA is struggling to carry out the remaining Space Shuttle missions. It’s true that now there are a lot talks about commercial space flights and interesting projects are presented. Maybe they’ll make up for the budget cuts that have crippled the space program that was supposed to create the successor to the Space Shuttle. We can only hope that at least commercial space flights will be successful!